For those who pay attention to the zodiac wheel, know that after Gemini and before Leo is Cancer. Direct your gaze to the night sky from your city or town and you will see between Gemini and Leo an almost empty area. The constellation Cancer is certainly not very bright and often only is visible during darker nights. Cancer appears as an upside-down Y, as in the image below. 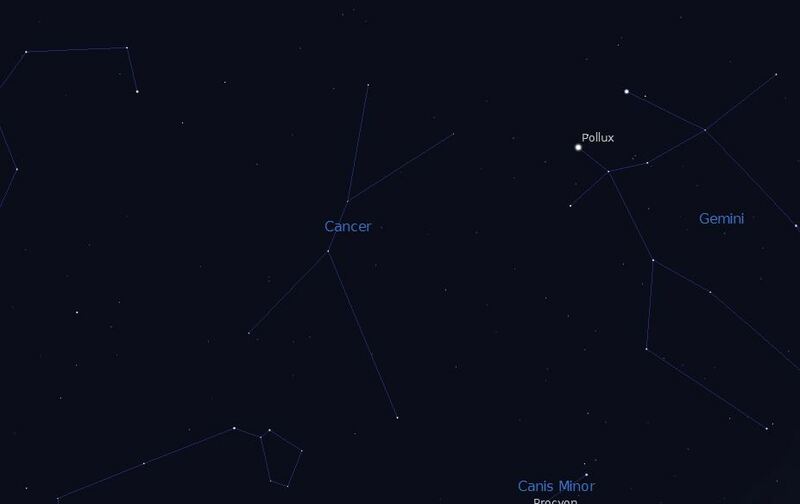 Orient yourself first on the bright stars Castor and Pollux in Gemini, as well as Regulus in Leo. The Moon will rise in the middle of the constellation Cancer in the coming Saturday evening, possibly making observation of the constellation difficult. The new Moon was only twelve days ago, however, allowing the night sky to shine a little brighter. In any case using the Moon as a guide to find Cancer is not a bad start. Cancer may be difficult to see normally, while the Praesepe (Latin for manger) can provide quite a sight. Sometimes called the Bee-hive Cluster, this star cluster is 610 light years away. 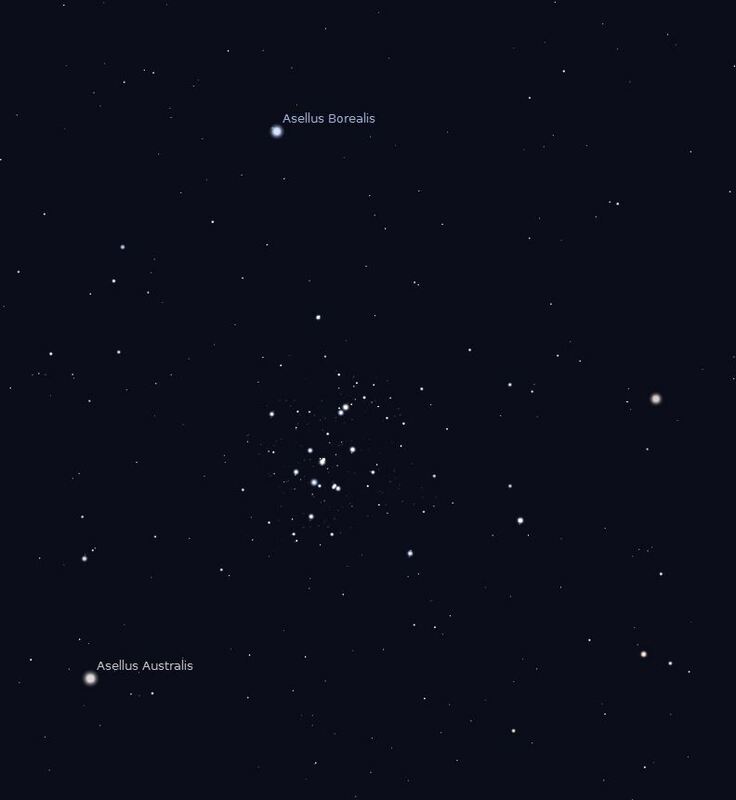 During darker nights, viewing the cluster with the naked eye should be possible, appearing as a cloudy spot. The cluster is even more wonderful to observe with a telescope. The Praesepe is straddled by two relatively bright stars from Cancer. The northern star is called Asellus Borealis, while the southern is Asellus Australis, and they represent the two mules that eat at the manger. Since the Moon has helped you identify the position of Cancer, don’t hesitate to have a look again later in the year, especially during a new Moon.